Preliminary ProceduresRelieve the fuel system pressure. Refer toFuel Pressure Relief.Remove the intake manifold. Refer toIntake Manifold Replacement.Remove the fuel feed intermediate pipe. Refer toFuel Feed Intermediate Pipe Replacement. ProcedureDisconnect the electrical connector.Remove the fuel rail and injectors as an assembly. 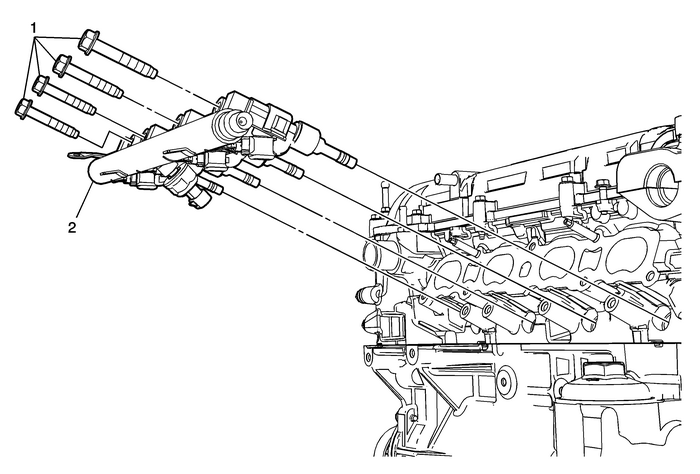 Refer toFuel Rail and Injectors Removal.It is necessary to rebuild the fuel injectors. Refer toFuel Rail and Injectors Cleaning and Inspection.Install the fuel rail and injectors as an assembly. Refer toFuel Rail and Injectors Installation.